The Merriment girls live in a Savic Royal Suite (SRS). 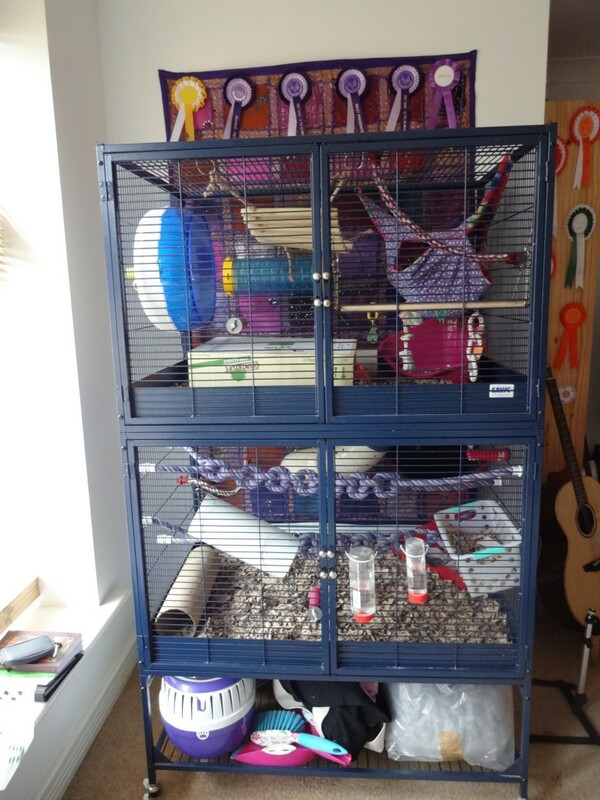 This is a fantastic, huge cage with fully opening front, making access and cleaning out really easy. My boys live in a Liberta Abode. 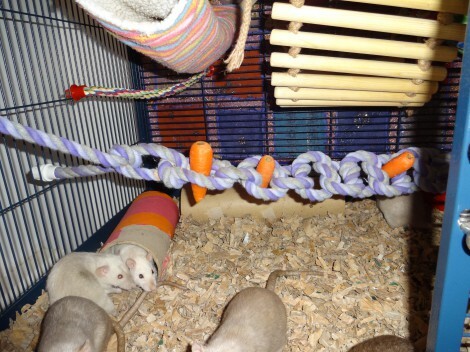 I use Ferplast Furet plus cages for smaller visiting groups and kittens above the age of around 3 weeks. Nursing mums and their babies are housed in a Cricetti 15, which also makes a good hospital and introduction cage. I use finacard (shredded cardboard) as the main cage substrate, with 100% paper based cat litter in the litter trays and shredded paper for nesting. I firmly believe that what’s in the cage is just as important as how big it is, if not more so. 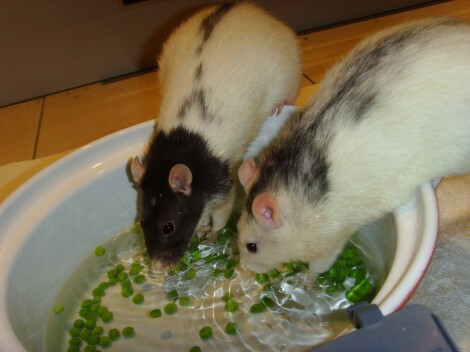 Rats are extremely intelligent, agile creatures who love to climb and explore, and it’s my duty as their owner to keep my rats’ bodies and minds active. My favourite things for in-cage enrichment are ropes, tubes and perches to encourage climbing, with hanging platforms and toys to challenge their balance. Peg baskets and hammocks are provided as sleeping places. My girl group have a silent spinner 12″ wheel to encourage running – please note that any wheel used must be at least 12 inches, and solid rather than barred, to prevent injury. My rats are also very good at ‘recycling’ large paper bags and cardboard boxes, as well as worn out items of clothing made into hammocks, and cheap charity shop finds like wine racks. 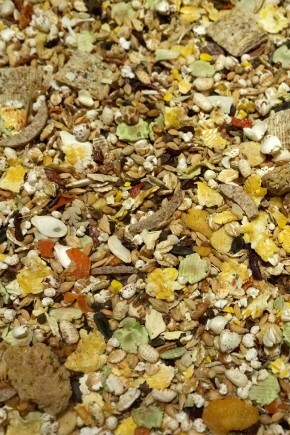 My rats are fed on a custom mix which is constantly evolving, but is generally made up of a rat rations base mix and Harrison’s Banana Brunch muesli, with added puffed grains, seeds, dried insects, vegetables, herbs and fruits, and low sugar ‘human’ cereals, which I scatter among the substrate to encourage foraging behaviour. I also feed regular fresh vegetables, mainly curly kale, carrots, broccoli and peas. Nursing mums and kittens also get regular fresh protein, such as tinned fish, scrambled egg, and chicken on the bone. I recommend the Scuttling Gourmet, by Alison Campbell, for detailed information on rat nutrition. All my rats are handled daily, not only to maintain their relationship with me as their human but also to check them over for any health problems. They also have regular ‘free range’ sessions, allowing them to run around and explore. More enrichment is provided during free range such as large tubes, digging boxes and pea fishing, and I also encourage them to interact with me through regular cuddles, hand and feather chasing, and the attempted teaching of tricks! © 2019 Merriment Rats. All rights reserved.